I read the classics so you don't have to. 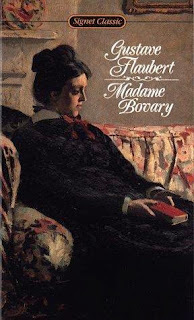 Flaubert shows the reader early on that Madame Bovary’s flight from one place to another brings her no relief, for her complaint is with no particular place but the universe itself. She runs like a rat in a maze, finding each new place as damned and disappointingly real as the one before. She can’t stop looking to the next horizon, however, in a way I find touching despite her famously off-putting egoism and ruthless vanity. Again and again Flaubert writes stuff like this: “She was filled with temptations to run off with Léon, somewhere, far away, to try a new destiny” p. 119. Emma continues to dream of moving away to a foreign land or to Paris—as if there were no problems in Paris! Place, as in the opening of Bright Lights, Big City—as in every case of despair, maybe—is in Madame Bovary a method of escaping reality and a crucial substrate of dreams. As such, Flaubert’s many beautiful landscape descriptions tend to involve naturalistic symbols of dream: fog (brouillard), haze (brume) and mist (vapeur). Flaubert’s landscapes are like old movie stars photographed with Vaseline on the lens in order to create a candle-like glow that obscures imperfections and welcomes the imagination to fill in the obscure blanks as it pleases. * The fog, like the Vaseline, clearly serves and represents the mind’s will to distort and obscure what it really sees. It’s there because Madame Bovary has unwittingly put it there. Her mind is a romantic fog. Flaubert makes this link explicit when the housemaid Félicité observes that Madame Bovary suffers from a brouillard dans la tête—“a fog in the head” p. 119. But Madame Bovary doesn’t understand that her head is befogged with corrupt “unrealistic dreams” (rêves trop haut p. 118) that prevent her from accommodating herself to reality. She imagines that the mélancholies de la passion stem from her accursed inability to satisfy those passions and to realize her fantasies. She never guesses that it’s in fact the other way around—that melancholy attaching to the difficulties of civilized life in the real world could cause her to seek relief in a fog of childish fantasies. But that is exactly the nature of her brouillard dans la tête and the nature of all those dreamy, adulterous affairs Woody Allen writes about so incessantly. Woody Allen generally writes about brouillard dans la tête as though it were inevitable, and Flaubert might agree, though Sigmund Freud’s oeuvre is based on the opposite idea—that human beings not only can see clearly if they dispel their defensive illusions but must dispel those illusions if they want to be free of the vicious cycle of despair. For that is what brouillard dans la tête really is: depression, and all the mind’s most inadequate and infantile romantic remedies for it. With the possible exception of Sylvia Plath’s The Bell Jar, Madame Bovary in fact lays bare the intricacies of depression better than any other novel. Because Madame Bovary’s melancholy arises from within and follows her wherever she goes, because it’s psychological in nature and not geographical, her efforts to erase it through fantasy escapes and affairs are all doomed to fail. Each one must be followed by another in endless pursuit of mirages of happiness that lie just there on the horizon. This leads to “her flighty airs” (ses airs évaporés p. 132) and “her continually youthful illusions” (ses illusions toujours jeunes p. 191). She cannot address her problems in the real world because she can’t look at the real world long enough to see herself naked of her vain dreams. Such is the “invasion of reverie” in her life (l’envahissement de leur rêveries, as is said of Emma and her lover Rodolphe, p. 194) that she remains always a child, dreaming, running, unconsciously fleeing and thinking all the while that she’s going to make the melancholy go away once and for all. Madame Bovary is cruel, yes, but she’s also suffering in earnest. She is overcome by guilt, self-hatred, and melancholy, “by an immense regret that stimulated passion, instead of suppressing it” p. 277. The roaring passion to escape leads to more damage and more self-loathing in a death spiral from which Flaubert won’t allow us to avert our eyes. Emma Bovary is like many people, maybe, as she sits in the opera in a fog, dreaming of another more perfect, more romantic, more glamorous life. “She bemoaned love, and yearned to have wings. Emma, too, would have wanted to escape from life and fly off in an embrace” p. 215. In the end Madame Bovary, who is often described as having her eyes only half-open, is like Flaubert’s blind beggar, who cannot see even with his eyes open wide. It’s a perfect novel and a perfect cautionary tragedy that draws inspiration from those tales of blindness by the ancient Greek dramatists. It whispers to us what the Delphic oracle did: know thyself…. *When master portrait photographer Philippe Halsman began his career in Paris in the 1930s, the prevailing style of portrait involved this sort of romantic distortion using filters and manipulation of the images. Halsman was one of a new generation who would make realistic photographs, only manipulating the images through lighting and exposure. Austin Ratner is author of the novels In the Land of the Living and The Jump Artist, 2011 winner of the Rohr Prize for Jewish Literature. It was praised as "a remarkable work" by Harper’s Magazine and featured in Publishers Weekly in 2009 as one of ten promising debuts. His non-fiction has appeared in The New York Times Magazine, The Wall Street Journal, and elsewhere, and his short fiction has been honored with the Missouri Review Editors’ Prize. He attended the University of Iowa Writers’ Workshop. Before turning his focus to writing he received his M.D. from the Johns Hopkins School of Medicine and he is co-author of the textbook Concepts in Medical Physiology. He grew up in Cleveland, Ohio and now lives in Brooklyn, New York with his wife and two sons. Copyright Austin Ratner. Awesome Inc. theme. Powered by Blogger.